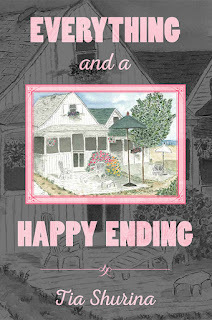 Mom Knows Best : Review of Tia Shurina's Book "Everything and a Happy Ending"
Review of Tia Shurina's Book "Everything and a Happy Ending"
When was the last time you read a book that you can relate to? Tia Shurina's book Everything and a Happy Ending is one that I can relate to. Tia had a father who was not present in her life as a kid due to an addiction. She had four siblings. Money was tight growing up. She questioned why her dad could not change. She felt like her family was dysfunctional. The list can go on in the similarities. While my dad's addiction was a bit different than Tia's, her childhood feels just like mine did. I really never knew my dad as a kid either, but like Tia it all changed when I grew up. I guess as an adult we can see things in a different view and see that there is a happy ending. This book is all about Tia's life and how the death of her father made a big impact in her life. Tia shares her life journey in her book. She shares things most would be afraid to reveal. Tia talks about her love life and her kids. She shares her talks with her deceased dad. She shares how her faith helped her also. I just love the quotes throughout the book and at the end of the book. She helps me to realize that there can be happy endings. Here are some of the quotes that I enjoyed reading. Read on to discover more about this book. Wow it sounds like I need to read this. There are some similarities from my own personal life here! Thanks for the review. Sounds like a really good read. Interestingly, I didn't really know my dad as a kid either, because my parents had a bitter separation, so I can kind of relate to that aspect. Sounds like a very enjoyable and relatable read! Excellent review! Wow this sounds like a very intense book! I really enjoy reading memoirs though. There is something about connecting with the writer and understanding a piece of their story. It's genuine. It's heartfelt. I love them and think I might check this one out! We just have to believe, obey and wait instead of hating ourselves, our life and complaining. dear dear tara, before i could reach, I had to turn on my ipad so i could write my words of thanks as JB serenades me..."& when the mornin' lite comes streamin' in..."
PS - what a beautiful Jeremiah quote Sarah...i love it. TU for sharing it...& helping me to keep the faith! peace! I have not heard of this book before!!! This sounds like it would be a great read. I have been looking around for books that I can relate to lately. This definitely made the cut. Thank you for sharing. I haven't heard of it before until here. This is one book I would find difficult to put down once I start reading. I recently lost a dear friend to cancer. She had her whole life ahead of her, but I guess God had other plans. I am just comforted by the thought that she is no longer in pain and is in the company of God and the angels in Heaven. This was an awesome book review you really went into a lot of details. I'm always looking for new books to read and this looks like a definite winner. What an awesome book, it's my first time to heard it and it's really pretty amazing! This book is really interesting! I really wanna have this book. I'll check it out. This sounds like an amazing book. After overcoming so much and finding happiness, I certainly could use an inspiration like that in my life. Checking it out! I am a book lover having a huge collection at home as a personal library. Everything and a Happy Ending sounds like a wonderful read as well as I love reading anything that could inspire you a personal life story of another! It sounds like a lovely book that will teach you more about life and happiness. I'm interested and I'd love to read it when I have the time. This sounds like a really lovely book, I am definitely going to check it out.